The Cumberland & Dumfriesshire Farmers Mart P.L.C. had forward 57 prime cattle, 2 young bulls, 33 over thirty month cattle, 2,417 prime hoggs and 3,043 cast ewes & rams at their weekly sale at Longtown on Thursday 1st April, 2010. Clean cattle lacked overall quality with trade sharper. Top price of 180.5p for a Limousin heifer from Hallburn, others 177.5p Upper Tinwald, 175.5p, 172.5p, 171.5p Toppin Castle. Limousin bullocks to 173.5p The Gill. Simmental bullocks to £1,150 Sceughdyke; Limousin £1,180 The Gill. Over Thirty Month cattle were dearer on the week. Limousin cows to 117.5p Bellbank, 114.5p Becks; Angus 114.5p Scugg House; Friesian 109.5p Jerriestown; British Blue 104.5p Greensburn. Limousin heifers 138.5p Plumpe. Angus bull £801 Whitstonehill. The 2,417 prime hoggs were well short of buyers requirements and met a superb trade selling regularly at 210p-220p even though the Easter weekend loomed. The sale average for hoggets up to 45 kilos was 205.4p and with the heavy hoggets it made the overall avergage 197.1p per kilo. 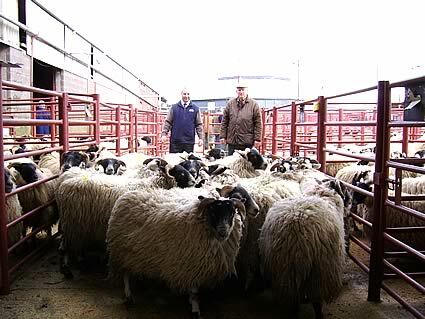 Top price of £116.50 per head and 248p per kilo for Beltex’s from Messrs MacTaggart Bros, Station Yard. Included on this day was the Annual Show & Sale of Blackface Prime Hoggs. The show was kindly sponsored by Frank Johnston Tractors Ltd, Carlisle and the championship was awarded to Messrs J.P. Fisher, Smalmstown, Longtown for a pen of 20 weighing 48 kilos and selling at £90 to the judge Mr. Paul Barker of Woodhead Bros., Colne. Principal prices: Beltex £116.50, £102.80 Station Yard; Texel £103.50 Newbigging, £98.80 Station Yard; Suffolk £99.80 Newbigging, £97.80 Dunjop; Charollais £98.50 Newbigging, £91.50 Culquhasen; Hill Cheviot £94.80 The Land, £93.50 Falnash; Blackface £92.80 Yett, £90 Smalmstown; Greyface £89.20 Oswie, £88.50 Hammershields; North Country Cheviot £88.80 Justicetown, £85.20 Ploverhill; Swaledale £83.20 Farney Shield, £77.80 Hammershields. Lightweight hoggs to £77.80 for Beltex from Newton; Hill Cheviot £75.20 Graystale; Texel £75.20 Graystale; Jacob £72.80 Smerlie; Shetland £70.50 Newbigging; North Country Cheviot £68.80 Unthank; Blackface £68.20 Cara View; Greyface £61.80 Newbigging. Cast ewes and rams were another good show for quality with best ewes maintaining recent rates, smaller plain and export types were dearer on the week but middle of the road ewes, especially fat were easier on the week. Top price of £169.50 for heavy Texel ewes from Winterhope, others £163.50 Winterhope, £150 Kilnford Croft; Charollais £164.50 Roadside, £153.50 Severs Road; Suffolk £161.50 Blackburn, £158.50 Kilnford Croft, £155.50 Church Road; Rouge £138.50 Newbigging; Leicester £138.50 Whintingstown, £102.50 Graystale; North Country Cheviot £117.50 Achow, £112.50 Carruthers, £108.50 Oldfield; Greyface £116.50 Roadside, £112.50 Winterhope, £106.50 Copperthorns; Beltex £108.50 Newbigging, £99.50 Severs; Bleu d’Maine £99.50 Middle Farm; Half Bred £96.50 Winterhope; Cheviot Mule £82.50 Stackbraes; Easycare £75.50 Westerhouses; Zwartbles £74.50 Stackbraes. Hill ewes to £95.50, £92.50 for Lleyns from Westerhouses; Blackface £80.50 Broughton Mains, £71.50 Horseholme, £69.50 Allfornaught; Hill Cheviot £73.50 Becks and Stackbraes, £68.50 Allfornaught; Swaledale £67.50 Brisco Hill, £64.50 Rosgill Hall; Shetland £56.50 Archibald Road. Rams to £161.50 for Texels from Roadside, £160.50 Severs; Suffolk £157.50, £150.50 Severs; Charollais £142.50 Rashee, £128.50 Newbigging; Leicester £138.50 Newbigging; Beltex £118.50 Rashee, £112.50 Severs; North Country Cheviot £108.50 Carruthers and Severs; Blackface £106.50 Newbigging, £82.50 Graystale; Border Leicester £102.50 Broynach; Bleu d’Maine £94.50 Rashee; Hill Cheviot £93.50 Becks; Swaledale £66.50 Farney Shield. Goats sold to £100.50, £93.50, £90.50 Coytre.